You’re having an awesome day, then someone calls and unloads their problems, like a garbage truck. The people we spend our time and energy with can affect us - filling us, or draining our resources. Tragic news can also alter our mood. Those of us in animal rescue can be easily depleted, as we are bombarded with surrenders, injuries, hardship and cruelty cases. Well-known for my sunny disposition, what happened to an innocent dog hit me hard, last month. In Broward county, Florida a pit mix was found badly mutilated, in a suitcase. Clinging to life, he was taken to VCA Hollywood Animal Hospital. Grateful Paws Rescue agreed to sponsor him. The one year old, reddish-tan pit mix was named Oliver, Ollie for short. After all he endured, and the pain he must have been in, Ollie had no reason to trust humans. Yet, he quickly won over his doctors and caretakers, wagging his tail and giving lots of kisses. A fundraising goal of $1500 was started for his medical care. Grateful Paws began to find him a home, in hopes he would prevail over his inflicted injuries. Ollie’s story went viral, circling the globe, igniting strong reactions. With over 4000 shares, donations came from as far away as Denmark and Germany, the account surpassed $40,000. Additional funds raised will assist other dogs in need. “We never imagined this kind of amazing, loving response”, stated Grateful Paws’ founder, Jan Milbyer. “Dog lovers around the world rallied for Ollie, sending their prayers, best wishes, and gifts to him at VCA”. The prognosis was hopeful. And then his heart gave out. The VCA staff (including five vets and a cardiologist) worked for over an hour to bring him back, but Ollie was gone. Jan tearfully added, “The only redeeming thing is that Ollie did not die alone”. His life could have ended in that suitcase, but Ollie served as an ambassador to his misunderstood breed and brought thousands of dog-lovers together. One such person is a new friend, Jonny Preston of Los Angeles, California. This actor, dad to a rescued German shepherd, and animal advocate has family ties in South Florida. He came up with an idea to honor Ollie , which went viral . #BlessingsForOllie started on Jonny’s Instagram, with a video in his car. “I wanted to do something good, in Ollie’s memory. I collected food, treats and toys for the local shelter. There was a ten year old mixed breed who had been surrendered. Scared, shivering in the back of his kennel he had also just lost an eye. Urgent Dogs of LA sponsored him and named him Ollie”. He arrived in Florida recently and now belongs to Jonny’s brother. A reward was established for information leading to the arrest of the person(s) who committed this senseless and cruel act. Private donations, combined with CrimeStoppers reward is over $40,000. Be a hero, help bring the dangerous person/people to justice. You do not have to give your name. CrimeStoppers Broward: 954.493.8477. A range of emotions was experienced, from anger, revenge and disgust to heartfelt sadness with the loss of this brave, kind, and forgiving dog we came to know, so briefly. Stating the obvious, being negative, or seeking revenge does not serve Ollie or any of us. May we honor Ollie, his bravery and forgiveness, along with all the good people---not focus on the actions of a deranged, cruel person - leave that to the law (and karma). 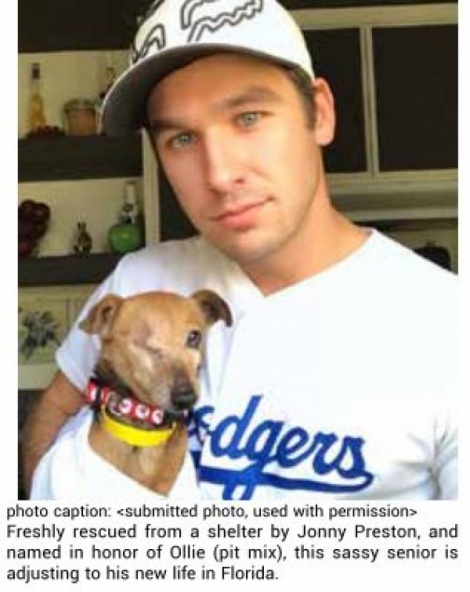 Nearly $100,000 has been raised in Ollie’s name, an abandoned, senior one-eyed dog has a new leash on life, and the kindness and generosity of strangers has proven again, that love always prevails. Animal abuse has been thrust to the forefront and has become a major topic and focus for those of us who wish to see a change in laws regarding animal cruelty and/or abuse. Thank you all, for the outpouring of love and concern. We are not alone in our gratitude, especially to those at VCA Hollywood Animal Hospital and the Hollywood Police Department who made this case a priority. Ollie was surrounded by loving and caring people when his spirit left his body. This young pit bull had nothing but kisses and wags for humans, even though it was a human who had inflicted horrific damage to his physical body. The alleged subject is in custody as of late November 2017! Through Ollie's ordeal, tens of thousands of loving, kind, generous people, were united, from around the globe. More than $40,000 for Ollie‘s care was raised. After his medical invoice was settled, additional funds will assist abused, abandoned and/or neglected animals coming into Grateful Paws' care. The reward fund has swelled to over $70,000 through CrimeStoppers and private donations. May we all live up to Ollie's example of love and forgiveness. Thank you once again for caring and for keeping Ollie in your thoughts and prayers. Grateful Paws is hosting a memorial tribute on Sunday December 10, 2017 at 2 pm at First Presbyterian Church of Hollywood, 1530 Hollywood Blvd, Hollywood, FL 33020. GREEN is the color for healing, we ask that attendees wear green to honor Ollie. Guests are invited to bring dog food donations, which will go to Redland feeders/caretakers. Guests are encouraged to hand paint kindness rocks to be exchanged with #BlessingsForOllie. Fateful Surrender Pawprints on the HeartSpeed Dating, for Dogs ?